First Second, 2016. 92 pages. This is very much part two of a longer story – not really a stand-alone book at all. But I like what they’re doing here. 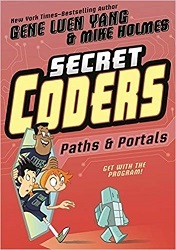 This graphic novel is a vehicle for teaching readers how to code using the LOGO programming language – but the story is fun and engaging. There are puzzles along the way – coding challenges are presented and the reader’s given a chance to figure out the solution before each step is explained. In fact, like the first book, this one ends with a coding challenge. And this one begins with the solution to the problem posed at the end of book one. The story will keep kids’ interest. There are even villains introduced in this book – a sinister principal and a whole rugby team doing his bidding to get new uniforms. So now their coding activities with the old janitor, Mr. Bee, who used to be a professor, are threatened. There are lots of secret rooms and something sinister going on. With this second book, I’m impressed where the authors take things. They show how to generate random numbers and then make beautiful patterns with code. The progression is straightforward – but so interesting. The story makes it more than just a coding textbook, and the fact that it’s a graphic novel makes the instructions and examples much easier to understand.